Have you found an online vendor selling El Dorado Superior White? I had a few drinks of El Dorado Superior White while vacationing in Mexico. Pretty decent bottle and label design. Very strong alcohol to the nose and palate if neat sipped. Mixes rather well with your favorite soda drinks. Sans intérêt, le nez est plat et n’en ressort qu’une odeur d’alcool trop dilué et de la noisette. En bouche l’attaque est douce et ne brule pas tout sur son chemin mais ne laisse ressortir aucune saveur. Un rhum qui n’est pas mauvais mais qui n’a pas de gout, aucune complexité. A réserver pour les cocktails. I normally drink dark rum but needed a white for my fresh pineapples. After a half hour with rum ratings app and the run of the store I decided on this. I was pleasantly surprised. The nose is sweet, although a little faint. It's not a dipper but is there a white sipper? flavor, softness and aftertaste Demerara are detected. 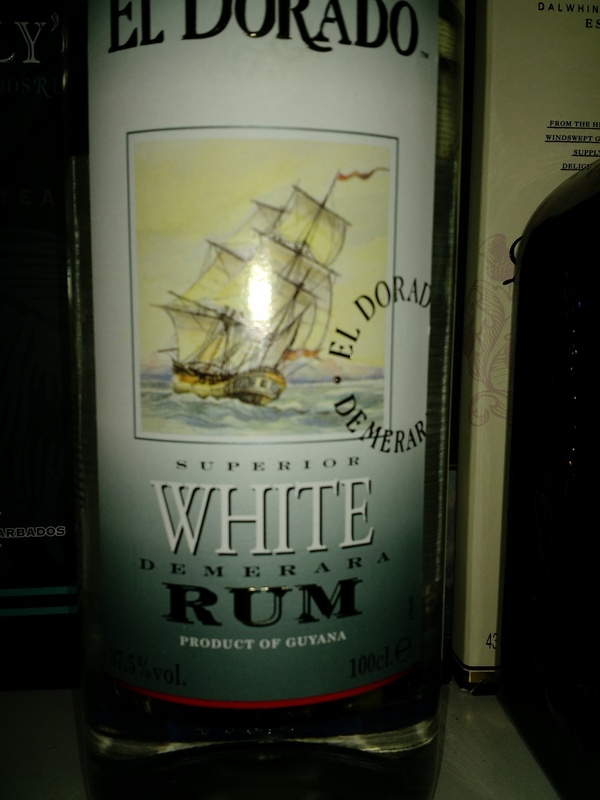 El Dorado Superior White is good white rum for mixed drinks or coctails. Nice aroma and clear color. Very good with crushed ice and lemon. Doet zijn werk in veel cocktails. Ietwat van die Demerara smaak. el dorado can make simple rum. the dark one ist good, this one too. just mix it with other things, like fruit juice or coke. for the coke please prefer the darker one. for cocktails with color elements, try this. Nice aroma but basic rum alcohol fragrance typical of white rums. Exceedingly clear in color...or rather lack of color. Nothing stands out in the flavor. A hint of sugar cane and a crispness about it making it quite good for mixers. Won't overpower any cocktail. And for the price a good bargain (I paid about $11 USD). Recommended. Un rhum blanc assez gras,simple et très bon. Un excellent mixer et meilleur à mon gout que le el dorado 3 ans. Clean sharp rum. So clean that you will be surprised that it is rum. This rum will not mask other flavors in tiki style drinks. Rum is my drink of choice, but I have not yet learned to review and distinguish all the nuances and subtleties. I just know what I like. I have tried nearly every El Dorado rum that I have had the opportunity to purchase. This is good, but very basic. For only a few dollars more, the 3 year is much, much (much) better. Fine for mixing and cooking, but there are too many better whites out there. A mixer with too much taste of nuts. Not to be repeated. Not quite on par with the better whites such as Matusalem Platino or Denizen. If you can find the 3 yr for just a couple dollars more go for it, one of the best rum bargains around. This is a white that disappears into cocktails and mixed drinks. If that is your thing, this is a good option as it's cheaper than most too.